Seeds are stored in cool dry places that are outside the range of direct sunlight. These should be the places where the temperature ranges do not fluctuate by much extent. People are more akin in storing seeds in the refrigerator, but, the experts opine against. They say that the seeds that are impossible to get properly dried should not be frozen as the cell walls might get damaged. There are fluctuations in preserving periods of seeds too. For instance, tomato seeds can be retained for more than four years if properly stored. When the seeds that are subjected for preserving are from own garden, the method is a bit easier. The seeds are procured and spread over a newspaper for air-drying. The process will be continued for a week. The seeds, after getting dried, are packed in a small paper packet or envelops. Papers are believed as the best medium for packing storable seeds. The packets are appropriately labeled with the names of the plant as well as other information meant to have pertinence with the seed. If the seeds are from own garden are planned to store, then planting of open-pollinated varieties are suggested as the hybrid varieties do not offer any guarantee to germinate the identical herbs. The seeds would lose the germination power over time. 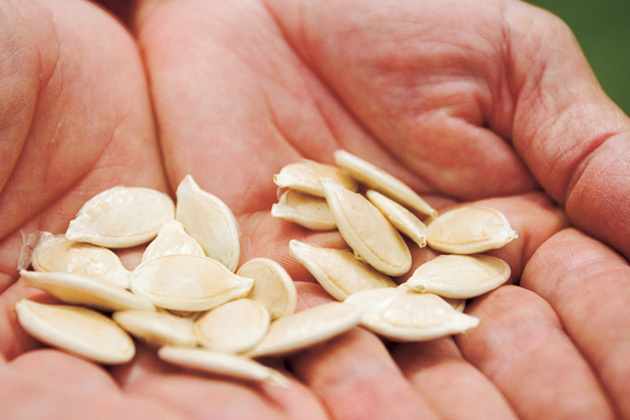 The ideal moisture content for these seeds is between 5 to 8 percent. Variability in the gene is enhanced in a nutrient-rich environment. This implies that the chance of producing super seeds is high when adequate nutrients are applied in the system. Thus, when the executor has planned to grow own seeds, he/she would be applying nutrients to that range as might be tolerable for the plants. When nutrients are not applied at the insufficient range, both weight and number of seeds will be reduced. It is also advised that the nutrients used in the system do possess natural and organic characteristics. Healthy seeds are sure to have better germination. Powdered milk is most frequently used as desiccating agents in the process of seed preservation. Normally 1-2 tablespoons of powdered milk are wrapped in a piece of cheesecloth or in a piece of facial tissue. This is placed in the seeds container. The powder absorbs any excess moisture coming from the air. A single application keeps valid for a period of six months. The use of Silica gel packets has also shown similar results. Addition of these things has proven worthy for seeds storage containers. Silica gels have an innate capacity to absorb moisture and the things are left pat dry. For making the storage condition more viable, the existence of low Oxygen environment is crucial. This is due to the fact that the presence of excess Oxygen is a deteriorating factor for seeds. The required supply for effective germination in a later period is guaranteed by keeping these in Airtight jars. When the moisture content is above 10%, vacuum sealing is advised. The metabolic process of seeds is slowed in the lower range of temperature; this is important for effective storage too. As per studies, 0 degrees Fahrenheit has been observed as ideal for such preservation. It is suggested that the temperature for seed preservation would never exceed 28 degrees. Temperature above 28 and below 0 would cause harm. Presence of light has never been recommended for an effective storing of seeds. The experts are of the opinion that the occurrence of light would cause havoc harm for many kinds of seeds though not for all. This is not welcome for seeds in any situation. Condensation forms while the freezer is opened and closed in close frequency. The seeds, if placed in the freezer, are advised to place behind the double barrier. Putting these seeds in a Ziploc or placing foil lined seed pouches inside mason jars have also been proved worthy. Use of Silica Gel packs has also been proved effective in combating condensation. Humidity has a dual impact on the storage process of seeds. Experts are of the opinion that persisting of humidity level higher than 5% but lesser to 10% has a desirable effect on the process of seed storage. Anything higher to that will lead to faster degradation. At the same time, if the level of humidity is below 5%, then the seed will suffer desiccation. When seeds are removed from the storage area in order to bring those back to life, the containers are brought back slowly to room temperature prior opening of the seal. This helps in preventing the condensation of atmospheric moisture over the cold seeds. Research studies have revealed the fact removal of seeds from the storage area should be done couples of days before germination.